Vocal Folds (curated by Jacqueline Dougherty and installed at Gertrude Contemporary, Melbourne) presents a careful selection of three video works which individually and collectively address the human voice in varied ways. The installation—like a notable number of Gertrude Contemporary group exhibitions over the past five years—wonderfully grants the visitor access to the material and phenomenal aspects of each work. The ‘white cube’ hasn’t been ignored or destroyed: it has simply become invisible in the face of the installed works, which means that the audiovisual content is comfortably and impressively conveyed without interference by inappropriate architectural edifices, inadequate acoustical accommodation, or improper curatorial assumptions of the audiovisual experience. Vocal Folds has been refreshingly conceived as a material occurrence, in accordance with its intention to investigate the material effects of the human voice as a generator of palpable linguistics and discursive abstraction. 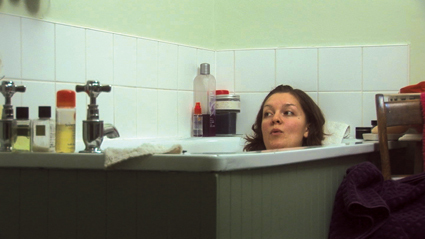 Valie Export’s film I turn over the pictures of my voice in my head (2008) serves as a critical introduction to these notions. Export’s work is a curious amalgam of linguistic didacticism and visceral scopic spectacle—which for me grants it a somewhat obvious audio-visuality. While this is to a degree typical of Viennese Aktionism and its after-effects, Export’s lugubrious intonation of a convolving Wittgensteinian text seems divorced from the conceit of using a laryngoscope to spectacularise the means of production of her language. For some, this audiovisual merger will intensify the experience (the thrill of inserting scopic and auditory devices into the human body is a longstanding trope of radicalised body art) but I found the work surprisingly monotonal and literal. Regardless, Export’s work posits one recourse to visualising the mechanics of language through the materiality of the vocal apparatus. Dawn Chorus—possibly unknowingly—recalls a longstanding tradition of composers attracted to the impenetrable vociferousness of birdsong and the complexity of its multifarious modes, dialects and individualised applications. Beethoven—gifted in hearing music both within his head and in the outside world—allowed birdsong to activate lyrical motifs in his pastoral suites, evoking the sensation of being immersed in the musical crossfire of the outside world. Similarly, Olivier Messiaen—skilled organist and ornithologist—spent innumerable hours meticulously transcribing birdsong patterns from which he elaborated complex rhythmic shapes and dense harmonies to simulate birds’ melodic phraseology. Oskar Sala—developer, with Friedrich Trautwein, of the trautonium and early explorer of the intersection of physics and acoustics—processed and transfigured birdsong tape recordings to render them ‘post-avian’ and hence monstrous for Alfred Hitchcock’s The Birds (1963). While Dawn Chorus is largely determined by an extant attraction humans have toward avian linguistic code, Manon de Boer’s two-screen installation one, two, many (2011) treats humans in a similar fashion. Shifting and alternating between two screens facing each other, a suite of three videos is projected, one at a time, and each time on a different screen. One video is a performance by a vocal ensemble in the large reception area of an old building, watched by a handful of visitors; the next is a performance by a solo flautist alone in a small domestic room; the third has the camera focused on a wall while a woman’s voice talks about listening to a tape recording of a lecture by Roland Barthes. When the Dardenne brothers stayed within the audible breathing space of Rosetta in their 1999 film of the same name, they treated her as if they were filming a combatant in a war zone. This intensifies the psychological claustrophobia which terrorises Rosetta throughout this gruelling film. When in Crazy (2002), Heddy Honigmann places her camera literally in the faces of Dutch UN peace-keepers as they endure the playback of songs they used to assuage their near-insane anxieties while working in debilitating warzones, she captures how the sound of music now ruptures their present space with overwhelming memories of the past. From the gasping breath of a frantic teenager in the former to the silent tears held back by aging men in the latter, the camera is used not to document but to listen. One, two, many doesn’t achieve this, yet—like the Valie Export piece—it affords the opportunity to make these links and consider the wider options of its audiovisual practice. Yet I’m frankly not confident that visual art professionals are entirely attuned to what I’m saying here. All three videos exhibited in Vocal Folds contain enough visual beauty—from the abject to the transcendental—to satiate the intelligentsia. And I’m equally sceptical that sound/music professionals are interested in the intellectual ramifications of their experimental practices. These videos contain soundtracks and sound designs implicitly opposed to conventional audiovisual cinema practices, thus emboldening those who think audiovision is best discussed as a radical or progressive intermedial venture. Vocal Folds bravely intimates that language can collapse or evolve into a supra-form through the materiality of the voice (something one can imagine Cathy Berberian or Joan La Barbara espousing) but I feel most people will stop just there. The Vocal Folds exhibition for me opened up possibilities from that point, to welcome how the depiction of humans engaged in making or listening to sound or music can illustrate an escape from humanist inscription.